CSIR NET Dec 2018 Results were out recently and Biotecnika yet again continued its winning streak with more than 240+ qualifiers both in JRF & LS category. This indeed is a proud moment for all of us at Biotecnika and we just want to scream out a loud our joy and happiness 朗. Hereby presenting a small letter from one our students Payal Bodar who has secured CSIR NET Topper JRF Rank 68. In this letter, Payal has penned down her entire journey of preparation for CSIR NET Life science Exams and how Biotecnika helped her along. 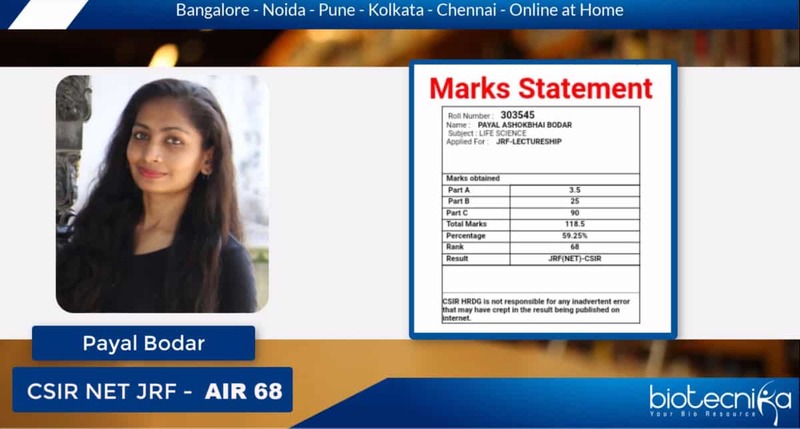 Via her success story, you can also understand her preparation strategy for CSIR NET, what all difficulties she faced and how she managed to cope up with it and came out as a Topper in CSIR NET Exams. Over to Payal now, do read till the end. came to know the result has arrived, I was worried but anyway as the paper went well I knew, I would qualify the CSIR NET Exam this time. It was a great feeling to see my roll number in those who qualified NET JRF. I was not quite happy with the rank that is 68 I got but still was happy to make my family proud. Craking CSIR NET couldn’t be easy without very much support of Biotechnika. I totally give all credit to the amazing faculty of Biotecnika. They really taught so well and made this lengthy syllabus of CSIR NET exam so interesting. Now I can say with full confidence that NET is not that hard to crack and although it has this vast syllabus, all that is required is study systematically, mindfully to qualify net. I want to thank the entire team of Biotecnika Pune for their constant support and dealing with us very patiently. Kajol Patel Mam made me love ecology and evolution by her way of teaching subject in a very interesting manner. She used to have so much enthusiasm to teach and a friendly attitude so we could ask questions without any hesitations. Karishma Mam was sweet and very good in her subject matter. She taught us molecular Biology, genetics by bringing some creative tools like the animated video of processes and you can see her willingness to teach nicely in her way of teaching. Only those who are passionate to teach can carry such behavior. It was great to learn from her. Preeti mam made that part of study easier where most of the biology student feel difficulties, yes mathematics and calculation part. She taught it very nicely. Biotechnika provided very good study material in hard copy which I preferred to read a lot. Also, online videos were easy to access and very helpful when I missed some classes. When few days were left for the exams, the entire team of Biotecnika was all time ready to guide us, ready to clear our doubts and confusions so I’m really grateful to all faculties other than Pune Biotechinka who helped us. It is said you can prepare by your own but I believe guidance in right direction plays a very important role in your success, in your growth. A GURU is needed for that, to show you right path, right efforts, to correct you wherever you go wrong. Biotechnika did that for me and I would never able to pay this debt. In CSIR NET exam of June 2018, I couldn’t qualify exam by 0.9 marks so I can say how sometimes even less than one mark become very important and how it’s necessary to be very responsible while attending your exam, sometimes your coolness, ignorant attitude cost you so much. I was a little disheartened when I couldn’t qualify, but this thing pushed me, made me more determined, made me more clear how and where I need to work and do my best. 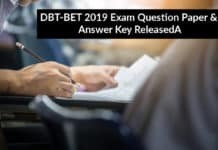 As I had doubt when I gave this June 2018 net exam that I might not able to clear by 3-4 marks because I couldn’t attempt some questions I knew due to lack of time, I started preparing for December 2018 net exam keeping all my mistakes in my mind, working through it was big task as this time it was a situation of do or die for me. I planned I prepared in all possible way I could do, I stopped other things and focused on the only NET exam, good food (thanks to my mother who made great food just to uplift my mood ) and good amount of sleep. My family was my constant support and they showed trust in me when I felt hopeless. They made the entire environment around me very calm so I can study without any disturbances. Preparing all what is needed to clear net is not the only thing a CSIR NET aspirant should keep in mind but time management is equally very important issue to take care of because I always took time for granted and I paid a big price when I couldn’t qualify net by 0.9 marks which taught me lesson for life that however well you are prepared for net exam or other other competitive exams, you don’t plan or manage the limited time given to you , you won’t get it done. To manage time again you have to look so many aspects of examination pattern very minutely and to understand exam pattern you have to solve papers of previous years. I’ve solved papers of last 14 years, I studied pattern, managed time accordingly, tried many tricks and implement some or other ways to attend paper very nicely in 3 hours or less than 3 hours. When you solve paper you get to know what portion of syllabus would favor you, what you are good at, what you are good at but taking much time ,so you can understand that you shouldn’t only solve paper for fun or by being an emotional student but using your logic and practical attitude you should solve paper accordingly. CSIR NET is just like other exam and anybody can crack it keeping the right attitude and the right amount of hard work plus smart work. I wish fear of considering CSIR NET a very difficult exam disappear from all CSIR NET aspirant and our nation get brilliant mind who study many disciplines of Sciences ( for life sciences aspirant , all the subjects of life sciences or biosciences) and made themselves eligible to teach and inspire other youth and also conduct research which brings a great change in our society and can be proved beneficial for welfare of not only human but all creatures on our mother earth. So this was Payal Bodar pouring her heart out, it clearly shows how happy she is. Entire Biotecnika is really blessed and we are extremely glad we could help out Payal in her endeavor of clearing CSIR NET Life science exam. We wish her all the very best for her future and promise to remain by her side throughout her career. In the above letter, Payal has mentioned a beautiful line – ” A GURU is needed, to show you right path, right efforts, to correct you wherever you go wrong”. That’s very very true, everyone needs a mentor in their life to guide them, starting from your nursery till postgraduation you had a mentor to teach you then why not take help of an experienced mentor to help you clear CSIR NET exams. Biotecnika is right here to mentor all the students aspiring to become scientists and professors by clearing the CSIR NET exam. 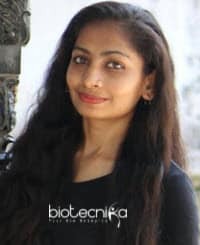 Wishing all the best again to Payal and other Biotecnikans who qualified CSIR NET Dec 2019 exam. More such success stories will be published shortly which will definitely inspire you to take up the right path in your career. Keywords: CSIR NET Topper Payal Bodar JRF 68, CSIR NET Topper JRF 68, CSIR NET Topper, CSIR NET Success story, CSIR NET Preparation Strategy, Biotecnika CSIR NET Topper, CSIR NET Dec 2019 Topper, JRF Topper CSIR NET, CSIR NET Life Science top rank, CSIR NET Life science Exam top rank success story. Please reach out to us on our Toll-Free number 1800-1200-1818 to get all the details or you can talk to us on chat as well.